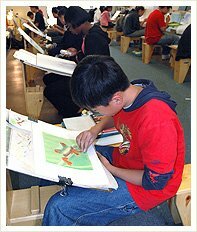 ArtWorks offers ongoing classes Monday through Saturday, year-round. Enrollment is on a monthly basis and once enrolled, students may continue for as long as they like. For students 4-8 years old, we recommend 1-hour class times. All students 9 and older are encouraged to enroll in classes 1 1/2 hours in length. Arrangements can be made for siblings of different ages to participate in the same class. Parents interested in taking classes should enroll in an Adult Class. Adults are taught on an individualized basis, according to skill and experience. Beginners are welcome. Parents are invited to schedule a Free Introductory Class for their child. This class can be scheduled when there is a permanent spot available in the requested class time. Teachers will use this class to determine whether the program is appropriate for the student, and to assess appropriate curricular level. For students, this class serves as an opportunity to participate and then decide whether they would like to enroll. Parents may watch this class. To schedule classes please email your inquiry or call our office at 415-759-5757. Please note that some classes may have waiting lists.